I have never had anything to do with Halloween other than giving children a boiled sweet and threatening to rip their heads off if my bin isn't exactly as I left it. I'm have doubts wishing folk a Happy Halloween, it's not an expression I have heard before but there's a first for everything. Looks good with the atmospheric lighting and the extra detail on the archway columns. I see you got rid of the 'spider'. John, it could be much better but it's okay for my level. Nearly all the spider has gone. it's a right job adding edges to make quads out of triangles and shifting vertices further apart. Ahh, so all your creativity has found a worthy cause! It looks terrific. Hope your bins are OK.
Pauline, I'm glad you think it worthy. Bins are fine as there are no children within three miles and the Jimmy Saville Guy I stuffed with straw keeps them away. That's pretty amazing, Adrian. Well worth the hundreds of hours that you put in in creating it!! Thanks Richard, it was a bit of a drawn out business, occupational therapy i think it's called. Trevor, I enjoy 3D but it does tend to wind me up. It's far from as good as blender can produce but little by little I do get better. I really dislike Halloween for a number of reasons, but my 45-year-old daughter loves it, and still celebrates even though her children have grown out of it. Frances, I gave much thought to this but I admit it is the first time I've done anything about Halloween. There was so much hype for the whole of October that I actually missed the night itself. So did I. I don't think we missed much. I've never liked Halloween since becoming an adult. Seemed to me that it was teaching children two things: how to beg, and to expect something for nothing. When our children were small we would go out to a restaurant every year together just to avoid the constantly ringing doorbell. Now the children are grown and gone and the doorbell didn't ring at all this year on Halloween. In our subdivision it is known by the children to go only to houses with the porch lights on; skip all the others. So things have a way of working out to everyone's satisfaction. The adults here in this country get crazier about Halloween than the children. My aversion to Halloween tells me either that I am in the world but not of the world, or that I am a cheapskate. Or both. Bob, no need to apologise. 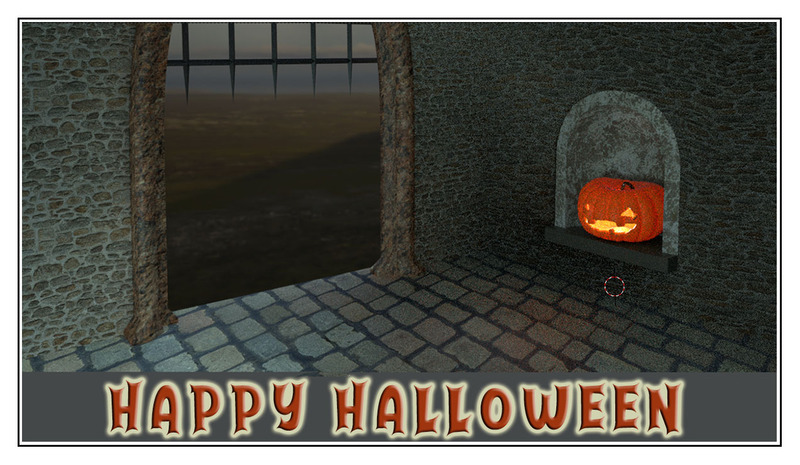 I have never had anything to do with Halloween but I had several bits of stuff that I'd modelled and took the opportunity to stick them all together. Monica, so do I. I can't stand scary things. WHEN THERE IS ONLY ONE OPTION LEFT.